What in the world are they thinking over at the Federal Reserve? The privately-owned central bank that runs the U.S. economy is now forcing local banks to remove every shred of Christian faith from their establishments. When Federal Reserve examiners recently visited a local bank in Perkins, Oklahoma they demanded that the bank take down a “Bible verse of the day” and crosses that were displayed on the teller’s counter. In addition, the agents from the Federal Reserve forced all bank personnel to remove buttons that said “Merry Christmas, God With Us”. The bank was also ordered to remove a “Bible verse of the day” from the bank’s website. According to Federal Reserve officials, all visible expressions of Christian faith by bank officials are now banned in all banks across the United States. Now, before people start screaming “separation of church and state”, please keep in mind that the “state” is not involved here. The local bank in Perkins is a privately-owned financial institution. The owners of that bank should be able to express themselves however they want. In addition, it is important to note that it was not an agency of the federal government or a federal court that ordered this private local bank to remove all traces of Christianity. 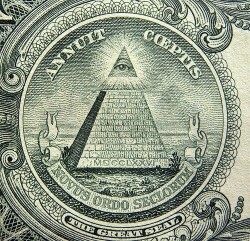 The truth is that the Federal Reserve is not part of the U.S. government. In fact, the Federal Reserve is about as “federal” as Federal Express is. Well, perhaps you will believe what the Federal Reserve is publicly saying about itself. In defending itself against a Bloomberg request for information under the Freedom of Information Act, the Federal Reserve objected by declaring that it was “not an agency” of the U.S. government and therefore it was not subject to the Freedom of Information Act. In the video posted below, former Federal Reserve Chairman Alan Greenspan makes it very clear that the Federal Reserve is above the law and need not answer to anyone in the federal government…. So where in the world does the Federal Reserve get the idea that they have the authority to tell a private bank that they cannot display a Bible verse of the day and that their employees cannot wear Christmas buttons? No matter what you think about the faith of the owners of the local bank in Perkins, the truth is that we should all be concerned about the kind of precedent that this sets for free speech. According to Federal Reserve officials, any visible expression of Christianity by a private bank may cause someone from another religion to be offended and feel as though they may be discriminated against by that bank. Therefore any expression of Christianity is “an appearance of discrimination” and thus must be banned. Okay, so if any expression of Christianity is “an appearance of discrimination”, will federal officials soon use all of the federal “anti-discrimination laws” already on the books to ban all expressions of Christianity in all private businesses throughout the United States? Once again, it is absolutely crucial to note that the local bank in Perkins is not a government building. Federal Reserve agents are telling private business owners how they can express themselves as they run their privately-owned business on private property. The following is a local news report about this very disturbing incident…. Does anyone still believe that we have “freedom of speech” in the United States? It is almost as if all forms of Christian expression are now regarded as something horribly dirty by our public officials. Even if you are an atheist, this should deeply concern you as well. When freedom of speech is taken from some of us, it is only a matter of time until it is taken from the rest of us as well. And since when does the Federal Reserve have any authority to tell any private citizen what they can or cannot say? This is just another example of how the Federal Reserve has gotten completely and totally out of control. The Fed has become an unaccountable monster that is just running around doing just about anything that it wants to do. It is for some very good reasons that many members of Congress are starting to publicly speak out against the Federal Reserve. Just recently it came out that the Federal Reserve has been handing out gigantic piles of nearly interest-free cash to their friends at the largest banks, financial institutions and corporations all over the globe. The American people have completely lost control over the financial system, and as long as the Federal Reserve remains in control that is going to continue to be the case. But now, not only is the Federal Reserve at the core of the rapidly developing financial nightmare that is enveloping this nation, they are also attempting to tell private bank owners what they can and cannot say inside their own private businesses. No matter what your faith is or even if you have no faith, you should be objecting to this. If the Federal Reserve is allowed to get away with this, it will be just a matter of time before U.S. government agencies come along and start ordering all private businesses to remove all traces of Christianity because they are “discriminatory” and they might offend someone. The freedoms and liberties that previous generations fought and died to defend are being stripped away from us. If you plan to say something about it before they are all gone, now would be a good time to start.